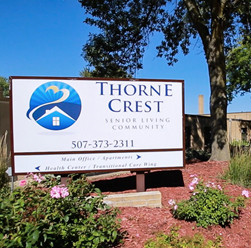 Thorne Crest Senior Living Community located in Albert Lea, Minnesota, offers clean, safe residential streets, a vibrant downtown and a myriad of shopping and dining options. It’s the ideal senior living community for anyone looking for both a community lifestyle and the privacy of your own home. With more than ten lakes in the city limits, a variety of parks, recreational areas and miles of walking trails, our community takes full advantage of the many amenities this beautiful part of the state offers. Downtown Albert Lea presents seniors with a variety of activities that include visiting numerous sites designated by the National Registry as historic, and the thriving arts community is anchored by The Marion Ross Performing Arts Center. Recently, Albert Lea was internationally recognized as a “Blue Zone” city through its participation in the Vitality Project. This unique, city-wide effort to improve health and wellbeing of residents is a clear illustration of what makes Albert Lea a special city; civic engagement, caring and a true sense of community. Albert Lea also serves as a regional center for the world-renowned Mayo Health System of Rochester, MN. Mayo’s medical center houses a clinic, hospital and The Regional Cancer Center. If you want to head into the big city, Minneapolis is under two hours away from Thorne Crest! Visit the famous Mall of America, go on a Minneapolis Brewery Tour, take in a ballgame at Target Field or check out one of the many museums in the area. Need more information about our active senior living community? Click the links below or call us at (507) 373-2311 to speak with one of our senior living professionals. We look forward to hearing from you! 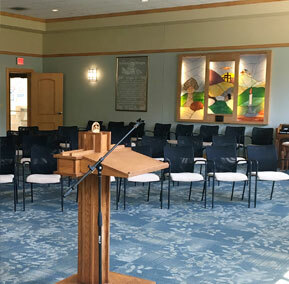 The Thorne Crest chapel offers a variety of worship and fellowship services, reflecting our commitment to faith-based care.